In a bid to incubate interest in space-related activities among the younger generation, Indian Space Research Organisation (ISRO) will soon launch a micro satellite named YouthSat. The project is jointly being developed in collaboration with M.V. Lomonosov Moscow state university, Russia. YouthSat was initially proposed by Dr. ABJ Kalam during his visit to Russia during 2005. It is the second satellite in the micro satellite series being launched by ISRO. To provide hands-on experience to student in space experiments and data-processing. To create a common platform for aerospace students across the world to jointly conduct experiments in space for the benefit of future generations and humanity as a whole. The students from the universities will participate from testing of the payloads in laboratory up to utilization of the data from payloads. The micro satellite bus is planned and designed to carry different kinds of payloads like earth imaging, atmospheric applications, weather monitoring, stellar observations, scientific experiments etc. It will carry three payloads, one designed by Russian students and two by Indian students. The project will provide hands-on experience to the students in space experiments and data-processing. While Russia will study solar activity, India would monitor its influence on ionosphere. The project will be useful to forecast the energetic solar events that could impact manned and unmanned space missions. SolRad (Solar Radiation) is the name of equipment being developed by Moscow state university. The experimental equipment SolRad is intended for registration of hard X-ray radiation within the energy ranges of 10-100 keV, measurements of gamma- radiation within the energy ranges 0.02-5.0 MeV and charged particles: electrons with energy of 0.3-3.0 MeV and protons with energy of 3-100 MeV. The detecting block contains detecting unit for X-ray and gamma registration, detecting unit for electrons registration, construction elements and electronic cards. The detecting unit for X-ray and gamma registration is a scintillation detector with NaN(Tl) and CsI(Tl) in a single pack overlooked by a photomultiplier. The squares of the crystals is 80 × 3 mm and 80 × 77 mm correspondingly. The detecting unit for electrons registration is a telescope composed of four thinlayered (~500 mkm thick) Si detectors with active area of ~6 cm². In order to extend the energy ranges of the registered charged particles it is planned to insert aluminium layer between the second and the third detectors, and copper layer between the third and the forth detectors. Electronics block provides transmitting of te scientific information to the microsatellite's support systems by 24 analog channels and digital interface. The block consists of the processor, storage elements and buffer cascades, which provide transfer of the signals from the detecting block and data transmission to the on-board telemetric system. 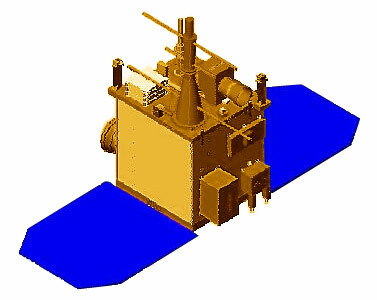 The payloads provided by ISRO are RaBIT (Radio beacon for Ionospheric Tomography) which will be meant for two-dimensional mapping of ionospheric structures- both top and bottom side along the satellite path. An LVHS (Limb Viewing Hyper Spectral Imager) (Visible) for the altitude profile of neutral and ionized species of the upper atmosphere. Not much information is available on the Indian institutes workingn on these payloads.